About half of U.S. adults (49%) report playing video games on a computer, television, game console or mobile device, and whites, blacks and Hispanics are all equally likely to say they have done so, according to a new Pew Research Center report. But there are some differences among those groups when it comes to how they see gaming. Today’s gaming population is a more diverse one than in previous years because smartphones and tablets have had a mainstreaming effect on who plays games, according to Dmitri Williams, associate professor at the University of Southern California’s School for Communication and Journalism. But one of the gaps that stand out is between those who play games and those who self-identify as a gamer, Williams said. Racial and ethnic differences are evident in other areas. Hispanics are the most likely racial or ethnic group to see a link between violent video games and actual violence. Half (52%) of Hispanics agree with the statement that people who play violent video games are more likely to be violent themselves, compared with 39% of blacks and 37% of whites. Across several questions, blacks generally hold more positive views about video games. Some 19% of blacks say that most games promote teamwork and communication, compared with 10% of Hispanics and 8% of whites. 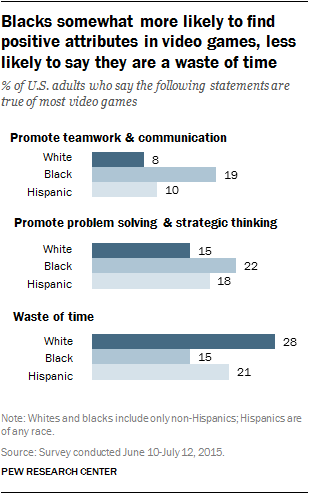 Blacks are also more inclined to agree that most video games help develop good problem solving and strategic thinking skills – 22% hold this view, versus 18% of Hispanics and 15% of whites. On the other hand, 28% of whites surveyed believe that most video games are a waste of time. That share is 21% for Hispanics and even lower among blacks (15%). A third of blacks disagree that most video games are a waste of time. Craig Watkins, professor of Radio, Television and Film at the University of Texas at Austin, said African Americans often exhibit broader engagement with certain types of media (such as social networking sites) when compared with other groups. These deeper experiences could extend to more-positive attitudes about some video games. The differences might also reflect the types of games being played and illustrate how blacks are embracing new technology as the digital divide narrows, he said. 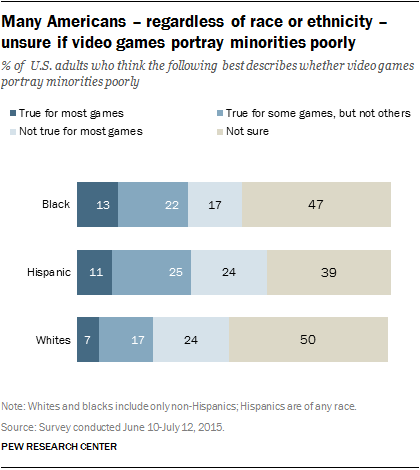 Pew Research Center also asked about how minorities are depicted in video games. Roughly half (47%) of American adults say they are unsure of whether video games portray minority groups poorly. Interestingly, this is the most common response regardless of race or ethnicity. Blacks (13%) are more likely than whites (7%) to say most video games portray minority groups poorly. Still, close to half of all blacks (47%) say they are uncertain if video games depict minorities in a bad light. Watkins noted that unlike journalism, television and film, the video game industry has not faced the same level of scrutiny or seen the type of advocacy around diversity issues. He said this lack of publicity could explain why a typical video game player might not think of these issues when thinking of video games.